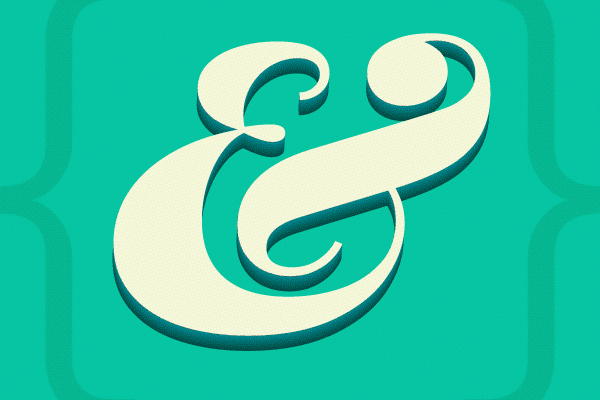 The ampersand (&) is a wonderful little character. It’s an ancient symbol, a ligature of the Latin “Et,” that connects words, phrases, and thoughts. Today, the use of & has become more varied, but & still maintains its original meaning of and, as well as, or this too. In Sass, & references the parent selector of a declaration block, allowing the selector to be referenced from within itself. This means things like pseudo selectors, sibling selectors, and so on can be referenced and grouped with that selector’s other declarations. & is a powerful tool to organize and extend your Sass. One of the most common uses for & in my Sass is pseudo class selectors. These include the :hover, :active, and :focus found accompanying selectors like <a> and <input>. When utilizing & in Sass, a single declaration block can be written for <a>. Then from within the block, <a> can be referenced with &:hover, &:active, and &:focus. These pseudo selectors are just the beginning though, :nth-child, :target, :checked, and many more await. Since & references the top-most selector, it can be extended with additional classes and/or an id like the pseudo class selectors. So let’s say there is a selector of .feature-class and we have an instance where it will be paired with .style-class, which changes the look of it. From within the .feature-class declaration block, we would have a child declaration that starts like this: &.style-class with its own declaration block. Sass will replace & with .feature-class, which becomes .feature-class.style-class in our generated CSS. So let’s update the example and replace the element selector <a> with the class selector .feature-class. See this example on Sassmeister. Notice, the &.style-class declaration block had its own &:hover and &:active which allowed pseudo class selectors for just the instances of the combined classes. While it is possible to go deeper, much like Inception, beyond four levels becomes disorienting and difficult to manage. The key to understanding the power of & in Sass is its placement in a declaration. In the first two examples, & was the first character, but there are cases where & can be used later in a declaration. In situations where the parent containing the selector causes the styles of the selector to change, we can reference the parent selector from within the selector’s declaration block. This is done by adding the parent selector before & in a new declaration block. So, if our class .feature-class needs to change when a child of .parent-class, we can make these changes from within the .feature-class declaration block. This feature comes in quite useful when targeting Internet Explorer with conditional classes on the <html> tag. Simply add a .lt-ie9 & within a declaration block to add any IE 8 or less styles to a selector. My absolute favorite way to utilize & is with adjacent sibling selectors. These types of selectors occur whenever you have a selector that needs to change when it is next to another selector. Most often, I use adjacent sibling selectors to modify layout when the same selector is side by side in HTML, like cases of paragraphs or list items that are commonly found in multiples next to one another. For a simple example, we’ll make <p> have no margin, but when a <p> is next to another <p> we’ll add a margin between the two. Of course, when it comes to adjacent sibling selectors, you’re not limited to the same selector in each instance. Perhaps you don’t want a margin after an <h1> unless it is followed by the appropriate sub heading. Similarly, both general siblings and child combinator selectors can utilize this method to write appropriate styles for a declaration block by replacing + with ~ and > respectively. Clearly, we have only begun to broach the power of & in Sass. Much more can be done to utilize & by mixing a combination of the formats discussed. Maybe you’ll have circumstances where you need to target the selector’s sibling, but only when it has a particular parent (e.g. .parent-class & + .sibling-class). At that point, you can take & to the next level by using it with mixins and extends to make wonderfully usable code—sky’s the limit. So dream big, but not too deep. Philip’s job title is frontend designer, but around the office he is known as the Sassmaster for his depth of knowledge and love for all things CSS. Read more articles by Philip or find him on Twitter, Github, Dribbble, and Codepen.